kandeej.com: She's Here! She's here! The Cupcake is here! i'll blog more tomorrow..but i am super exhausted...and it's not so easy for me to type right now...just so excited to show her to the world!!! and little Cupcake (who we still haven't picked out a name for...we have up to 30 days! ha ha ha) at 7:04am! she is snuzzled up next to me right now...and my heart grew even bigger today with love for her! I promise I will type more filling you in on all the fun details about everything from labor and everything else....I'm just a wee bit exhausted.....it's alot of work getting a cupcake out of the oven! ha ha ha..but worth every single moment! Our Cupcake is here!!!! Just had to show her to you all......"our cupcake is here!" Congratulations Kandee! She's beautiful. You and Bobby look so happy and proud. Lots of hugs and luck to you both. How exciting...Congratulations, Kandee!!! Enjoy this time, and Happy Early Birthday to Bobby! What a cute cupcake she is! wow!congrats kandee. she looks beautiful!!!! congrats ! she is soo beautiful ! and happy early birthday bobby. this completely melted my heart. you, bobby, and cupcake are absolutely adorable and i am so excited for yall! you look glowing in your picture. Kandee she is so beautiful...AMAZING! Wonderful!!!! Congrats to you and Bobby!!! What a beautiful lil' cupcake! She is going to be one gorgeous girl with the genes you two gave her! Awww Kandee shes so beautiful ! 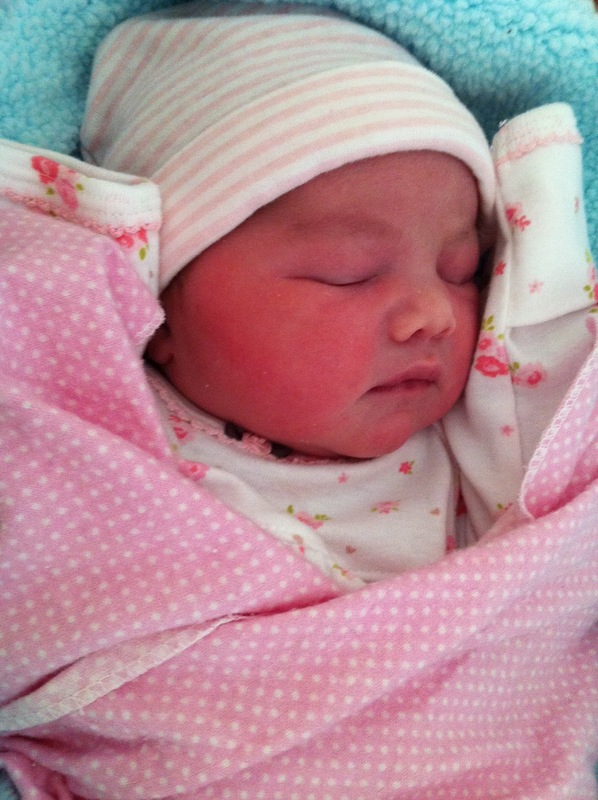 i Cant believe shes here already :) Your so lucky to be blessed with such an adorable baby! i wish you and the baby the best and a great nights rest ! Your baby was born on the same day as my sister's birthday. The pictures are beautiful! She's a doll. So happy for you... praying that you'd heal quickly and that these first few days together would be wonderful! I'm excited to hear about how your at home birth went. I think she looks like a Maddie. Congrats! congratulations Kandee! I'm so happy for you! Can't wait to know what name you'll pick for her. And she's beautiful!! I've been thinking all day "I wonder if Kandee had her baby"
awww she is just so precious, congratulations kandee! congratulations kandee and bobby!!! how amazing she is beautiful and what a big healthy girl she is! i been waiting for this ever since u told us u were pregnant and i am so excited i screamed when i saw she was here!! She's beautiful!! and yay for finally getting to meet Bobby...he looks so happy to have his early birthday present = ] can't wait to read about how it all went. hope you get enough rest tonite. Smiles and hugs to you all!! Congratulations!!!! She looks beautiful :D Just like Mommy!! Congrats to you and Bobby! Shes adorable! Congrats! She is a doll! I can't believe you have any energy after giving birth you wild woman:) I was a swollen zombie after my birth..go you! congratulations!!! that is sooooo exciting & she is absolutely gorgeous!!! best wishes! Congratulations, Kandee!!! Now your little cupcake can experience the joy of the world, especially with you as her mom! This is a wonderful early birthday present for Bobby! Congratulations to you both! *snif* :'D I've been praying for her! Oh goodness Kandee, Congratulations!! And thanks for the wonderful comment you left on my blog. I couldn't speak because I was so in shock, teehee. You are basically famous in my perspective and a wonderful role model. Congrats on your cupcake comin out of the oven!! Congrats, Kandee!! That's amazing. So happy you had a healthy baby girl. Please take adequate rest and u dont need to say sorry at all for not posting for a while.. u deserve all the rest ..
Congrats to you and Bobby! God Bless u all! !I'm so happy for you and for your family!! Welcome little sweet mini Kandee!! Congrats Kandee! She is absolutely beautiful! Happy early birthday Bobby, it was my moms birthday today too! Ahhh Im so happy for you!!! I know shell be the luckiest baby girl in the world, imagine a mom thatll teach you how to do proper make up??? Hope everything is well and from the bottom of my heart, CONGRATULATION. Congratulations!!! Can't wait to find out what cupcake's name is. Enjoy this little bit of time...the baby stage goes by so fast. Praying for you Kandee and family. OMG! Kandee, she's absolutely beautiful!!!! From one mom to another, congrats!!! Congratulations on the arrival of ur cupcake...can't wait to c more pictures of her. Have a good rest! Oh congratulations to both of you! I just love pics of new daddy's holding their babies! I think sometimes the world down plays a fathers love but you can see him just glowing at her! Much love to your whole family Kandee! And a fast recovery! I want to say more than just a congradulations, because the baby herself needs a kiss and a snuggle from one of her mama's beloved followers. Give her my love, and I hope she wasn't too painful haha. She'll be the next person to change the world. ~Person who adores sweet stuff. she is adorable kandee! Congrats! Congratulations and good work mommy. KANDEE! I am so happy for you! She is precious! I am so glad that cupcake is here and what a cute family yall are, and I cant wait to see what you name her! Congratulations to u both! She is finally here! She is beautiful. Hey, why not name her Cupcake? Kandee & Cupcake :) get some rest u beautiful mama u! Congrats on having such an adorable little girl! There is nothing better then being a mommy huh? These pictures are precious! They brought tears to my eyes!! We all know that when mommies bring their babies into the world, they cry with joy, but to know that the daddy is just as happy and has tears in his eyes too, it touches my heart! I bet he's super excited to be able to finally hold her in his arms. Congrats to the both of you!! I'm sure all your other children are soo happy to have their new baby sister here too! You are a wonderful mom and your family is soo beautiful!! Much Love! Awwww....Congratulations Kandee. She's so beautiful!!! Happy Birthday Cupcake!!!! (thats not her name but thats what we all know her by) So glad to have you join the Kandee family!! Not only does she have two wonderful parents but she has millions of people that will be rooting for her the whole step of the way!! Cant wait to hear all about your delivery!! Get some rest!!! I knew you were going to go into labor because you went to bed in so much discomfort, I knew cupcake was coming so soon... and she did just hours later.. Congrats to You all!! You’ll start "aahing" and "oohing,"
Kandee, your litte cupcake is so beautiful! Her cheeks even look like pink icing! I said it before but you can use my daughters name if you like its Daynika ( Day-Nick-ah ) I made it up but it fits so if it works for you lil feel free. I also love the name Elsie too! I hope she lets you get some rest tonight, sweet dreams and blessings on your whole family! i'm so happy for you. i was checking my facebook and saw your post. when i read your blog out loud my fiance said "i knew it. i knew that she would have the baby on sunday. the video yesterday made me know she would, with all the contractions she was having. i just knew it." she is so beautiful. congratulations. get some rest. have fun with baby. i can't wait to hear what you name her. congrats again. Get some rest now, K.
Cant wait to hear more about her! Ohh, this is so exciting! I'm so impressed you actually blogged on your delivery day! Thanks for keeping us posted. All my love to you and the baby. she is soo beautiful and adorable ! CONGRATULATIONS MISS KJ!!!! you and bobby are the perfect parents for a beautiful baby girl! O-M-GEEEEEE!!!!!! YAAAAAAAAY!!!!! im SUUUUPER excited for u! CONGRATULATIONS!!!!! she is adorable!!! happy birthday to her, and the new daddy!! i havent had children yet, but when i c this (the end result) it makes me wanna have one (kinda, lol)... congrats again kandee!!! She is absolutely precious! Congratulations! Hope you have a speedy recovery and the sleep fairy sprinkles lots of sleeping dust on you and baby!!! Tears of pure joy and happiness for you filled my eyes (and still are)! I'm so thankful all is ok with you, I hope and pray you heal quickly! I know bringing a beautiful miraculous human life into this world is no easy feat! I hope you all sleep so peacefully tonight and I pray God blesses your family so much, I know he already has! ;) I pray he continues to do so in BIG ways! I have mentioned that I have taken this from your blog beneath the picture, but if you fro any reason don't want me to use it, please let me know and I will remove it asap. Congratulations Kandee!!! I'm so happy for you! I've been following your pregnancy blogs every day and I know how excited you must be to see you're precious daughter. Good work, Kandee! And congratulations to you and her proud papa. Awww, congratulations to you both!!!! She is so precious! Congratulations! Many blessings to both of you. I am glad to hear you are ok Kandee...you are one strong Momma! im so happy for you kandee!!! :)and your lil cupcake! She is perfect! Im so happy for both of you! Congratulations! She's beautiful just like her Mommy. Awwww how precious! Congrats Kandee! Awww..she's perfect! Congrats! Many Blessings to your family and to the baby! =) Much Love! Yay! I'm so happy for you and your sweet little family! What a beautiful addition, I can't even believe that you found time to even post ;) you are so sweet to share the news with all of us. You have earned the title of a "supermom" for sure! Congratulations to you all. LOVES! CoNgRaTs~~~ What an amazing early birthday present! She's adorable cant wait to see what you'll name princess and the white stick....Blakes so funny...I mean race car driver dude :D!!! 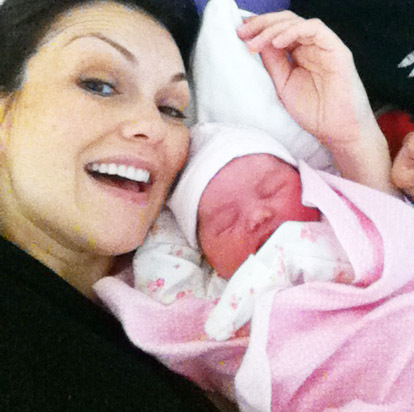 Oh wow Kandee, little cupcake is so beautiful!!! Look at her round rosy cheeks, so cute!! Congratulations to you and your family with this gorgeous baby girl. I hope she brings joy and laughter and grows up to be a happy and warmhearted person like her mommy. How wonderful that you gave birth at home. Are you gonna breastfeed the little one? Take care, get some rest and cuddle your little bundle of joy!! She's beautiful ! Looking forward to hearing more. Sweet dreams ! Congratulations!! She's perfect & beautiful!! She's GORGEOUS, Kandee and Bobby! (and with parents that look like you two, there was no other way for her to be!!) And she's perfect, too!!! BTW, it's extremely UNFAIR that you look far better than I do even AFTER hours of labor! How is that possible??? huge huge congrats.....I have always loved your videos/blogs on make-up and life....enjoy that cupcake, she looks scrumptious!! THANK GOD SHE'S HERE!!!! Dios la bendiga! She's gorgeous mama Kandee!!! What an amazing feeling must be to have a child!! I'm very young still to know that (17 going on 18)! hahaha! God bless her and bless you for bringing such a sweet and inocent soul to the world!! Happy Birthday little cupcake!! You are very loved (by a lot of people who don't even know you at all hahaha) We LOVE you too Kandee!! Congratulations again!! No words needed here! Your pictures speak for them selves!! So happy for you! Wish you all the best with little cupcake, I know for a fact she's going to be just fine with all the love your family spreads out <3!! congratulations!! What a beautiful baby!! congratulations! Happy birthday to everybody! holy gosh, she is beautiful! and i am so glad everything turned out OK! you must be a very proud mother! Congratulations!!! U have a cute cute cupcake!! And you are beautiful! Congratulations lady!!! What a beautiful day! And she is an aquarius----yay! congrats again kandee. i just thought i would give a suggestion for a name. i really like the name ARIA. it's pronounced are-e-ah!!! i think it's a very cute name and it sounds kinda princessy. Princess Aria!! very cute.have fun with your little cupcake. hope you are getting some rest. i haven't had any kids yet. but i know that it takes alot out of you, so get all the sleep you can. you mom is a very lucky woman, she has a very beautiful and caring daughter and very cute grandchildren. i love reading your posts and watching your videos. Just wishing you and the family all the joy God can spread and hope you heal well. I know you haven't decided on a name but it would be cute to go ahead and name her cupcake, (Kandee and Cupcake?) ok maybe thats too much lol. Also, I too have the same Hello Kitty debit card and I love it! I always get compliments! Oh and even though I'm turning 22 on Tuesday, my family threw me a Hello Kitty b-day party the same day your cupcake was born. Kandee! Congratulations! She is PERFECT! You and Bobby look as though you cant stop smiling! So happy for you! HURRAY!!! Finally!!! Great job! I'm so happy for you! congratulations to you and Bobby! she's precious! She's perfect! She's sooooooooo beautiful!! OUR LIL' CUPCAKE!! hee hee!! She is perfect! I love the chubby cheeks!!! Congrats! Awwwhh! The long awaited princess and the white stick :D YAY! Congradulations, you both look beautiful!! She's an Angel. Blessings to you and your's. there are tears in my eyes. she beautiful, and you look great too! Awwww Kandee, she is precious!!! Congrats to you & Bobby! Wonderful job momma! I'm so happy for you!!! Yay!!!! Congrats to you and Bobby! She is so adorable! I love you!! All the best wishes for all of you! and Happy birthday to Bobby too. OMG Kandee im sooo happy for you. I wish i was there and i could hold her and give her a biiig kiss. CONGRATULATIONS KANDEE!!! She is so beautiful, and adorable! You are so lucky :) I send you much love and kisses! She is soooo beautiful!!! Congratulations to all of you!!! this is so exiting! congratulations to you both on having a healthy beautiful daughter! kandee, i am so happy for you and your whole family. it is really kind of neat the attachment you can form to someone you have never met, but i am as excited for you as i would be for one of my good friends i've actually met! i am writing this through happy tears for you! she really is a little doll and i am proud of you! you did good. i got a really sweet visual of those sweet children walking in fresh from sleep to see their new sister. what an awesome, precious memory for you all. God bless. i am excited to see her grow up and see your continued success in life. sleep well and get back when you are ready, we'll be here, don't worry about us, just focus on your family and yourself now. sending you lots of love and hugs today to all, xoxo. p.s. my daughter, who found you, sends her love too, she is 8 and thinks you are terrif and my almost 2 year old loved looking at the baby's picture:). you touch many lives in a positive way, never forget that! Hi kandee! I am 19 years old and have always wondered how it feels like to have a life growing inside my body. I am so happy that she is finally here. I don't know why she reminds me of Snow White, not because she has an evil mom of course, she has a very beautiful and kind mom. It would be very nice if you name her something snowy and winterish. Haha. Best wishes for you, Bobby and your little snowy cupcake. I can't wait to hear all about it! Talk to you later!! can her name really be cupcake? PLEASE? cupcake's dad is CUTE ^5! Congrats Kandee- she sooo cute!!! she is so gorgeous. congrats to u sweety your cupcake is already here and she is healthy and glowing. thanks for sharing it with us!!!! all the love in the world for u and your beautiful family. Congratulations to the proud parents!!! U r gorgeous Kandee! we love u all. take good care of yourself! Big Kiss! She's gorgeous! I'm sooo happy for you Kandee, no words can describe! <3 I'm happy you're both ok! please, take your time Kandee, now it's your time to relax :) I'm sure little cupcake is born to a happy and loving family and she's very lucky because she got the BEST MOM on earth! Congrats! She looks perfect. Two name suggestions for you because she looks so precious. My son is the biggest blessing ever. Kandee, I have been following your blog for over a year now, and I must say, this is the best blog yet! I am so happy for you and Bobby. I also want to say thanks- for sharing your story. You have inspired so many people on so many ways. God Bless. Congrats on your beautiful "cupcake". I wish you nothing but happiness with her. She is beautiful!! I was just thinking about cute names for her and I came up with Brandee. It is like using both your name and Bobby's name! Good luck with everything! And I can't wait to hear "Cupcakes" name! Don't worry about typing up anything!! Just enjoy that little bundle of joy- she is gorgeous. Take care, the blog can wait;-) Your fans will still be here if you need to take some time off- promise!! Congrats! She is adorable and you look great! She's such a cute cupcake! Enjoy your little girl! Congrats to you & your adorable little family! Little Miss Cupcakie is just so precious! What a blessing! Makes me want another Little Miss Priss (thats what I call my cupcake! ):) Enjoy & get lots of rest! Can't wait to see more video & pics!